Inflatable obstacle courses are an absolute blast! People of all ages love being challeged. And let’s face it, we all secretly want to win! 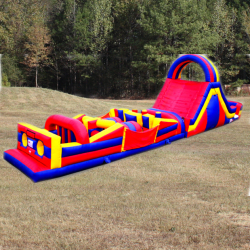 Inflatable obstacle courses are one of our most popular inflatable rentals for team building and corporate events. They are also perfect for parties, school events, church outings, carnivals and so much more. What’s fun about inflatable obstacle course rentals is that watching the challenges are almost as entertaining as participating in them. 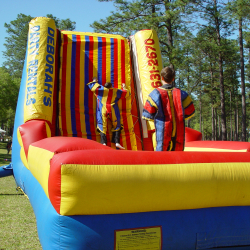 Imagine the entertainment of watching challengers face off in a Joust, a rock climb challenge or a bungee run. But don’t forget to have your camera ready! 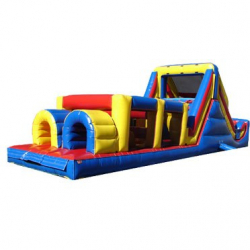 If you are looking for seriously fun and entertaining inflatable party rentals then you will love the sticky wall, toxic drop and toxic twister inflatable obstacle course rentals. They are a perfect interactive rental option for guests who are looking for some extreme fun. 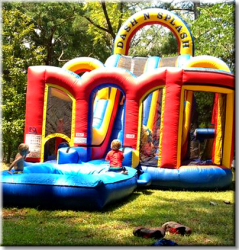 If you are hosting an event and looking for interactive and obstacle course rentals, Deborah’s Party Rentals can help you plan for the perfect event. If you need tent rentals, table and chair rentals and concession rentals we can help you with these items too. Need help with delivery, no problem. Call one of our event planning specialists today at 205-631-2670. No event is too small or too big!